Some of you may have seen this in Jason Stark's NL Central report card article. We don't agree that "when all a team does is pretty much stand pat, it's grade needs to reflect that." The Reds were a good young team. Adding unnecessary parts would only hurt them and their future buying power. 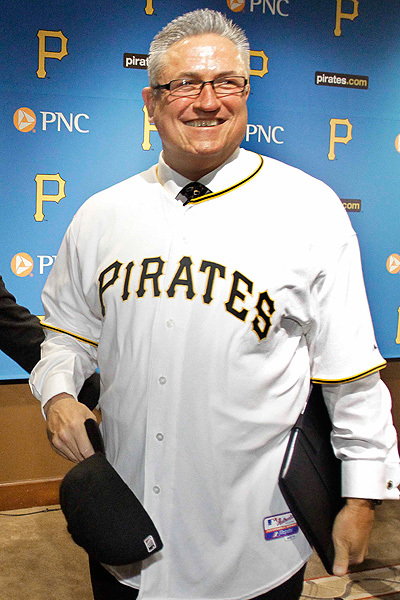 The best part of the article, for us, was how happy Clint Hurdle looks in this photo from his first press conference. Best Wishes to Clint Hurdle! He'd supposedly a wonderful man, and I hope the Pirates bring some excitement to the generation of young Steelers fans who couldn't care less about baseball. Every manager looks happy the day he gets hired, but Jim Leyland was the last manager to have a winning season in Pittsburgh. The Pirates have not had a winning season since 1992. Pirate fans under 18 weren't even alive for Sid Bream.